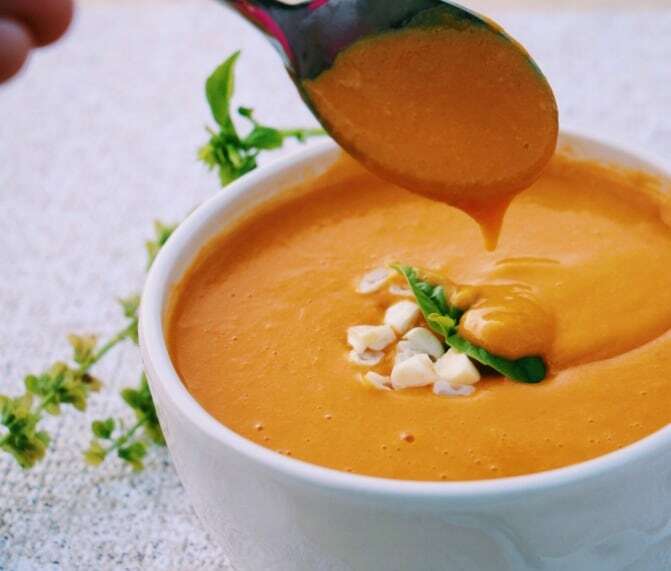 Soup weather is finally here, and we have been loving this sweet potato and corn chowder! 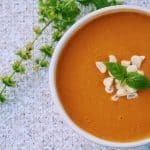 No cream required, this soup is loaded with just good things and is a great way to these those veggies in little bellies. 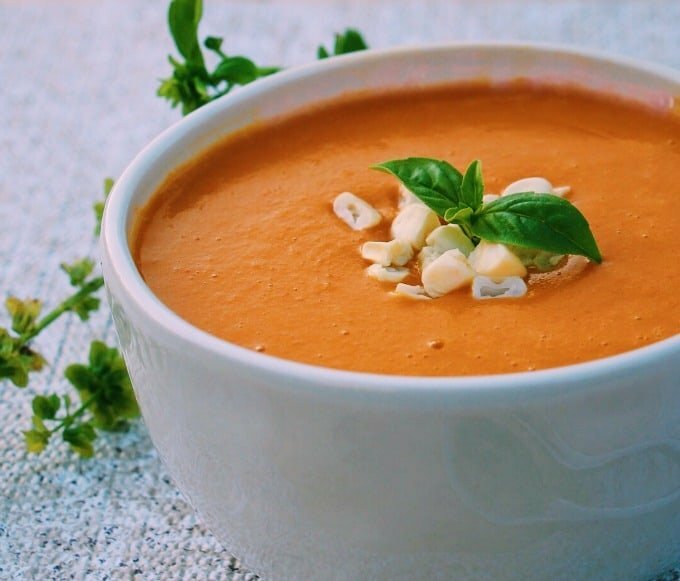 Soup weather may not sound that exciting to some, but if you have been living somewhere like California, where it has been stinking hot for pretty much FOREVER, you would be excited too. I have celebrated by making soup. A whole lotta soup. So much soup in fact, that when my husband came home from work last night he asked ‘is it soup week here or something?’ He may or not be over it. I’m fine with it either way. There’s something so so comforting about a big pot of steaming soup on the stove, especially when it is cold, dark and rainy outside. Probably a swing back to my childhood in Northern Ireland, where it rained a lot (and I mean a lot), and we ate a lot of soup (and I mean a lot). 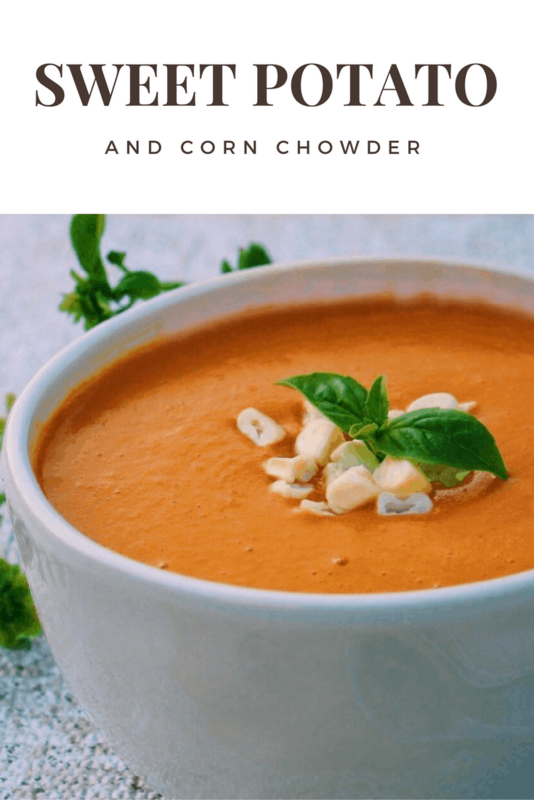 This Sweet Potato and Corn Chowder is really easy, and is a great way to get the kiddies eating all their veggies. You can save time by using canned corn, but the fresh stuff tastes way better, and is so worth the extra 5 minutes prep time you will need. From start to finish you can be done in 30 minutes max. If you want to start using a super easy Homemade Vegetable Broth, be sure to check the recipe out here. If you have a handheld immersion blender, it can all be made in one pot. I don’t, so I blend in two batches in the vitamix – I also like to do it this way to make sure its super smooth for thermos lunch purposes the next day. Oh and this sweet potato and corn chowder freezes well, so you can always pop some in the freezer for a busy night. For some cold weather soup ideas, check out my Cream of Broccoli and Pistachio Soup or for something a bit different check out my Oven Roasted Chicken in Immunity Boosting Broth, where you get a soup and a whole roast chicken in the one pot. 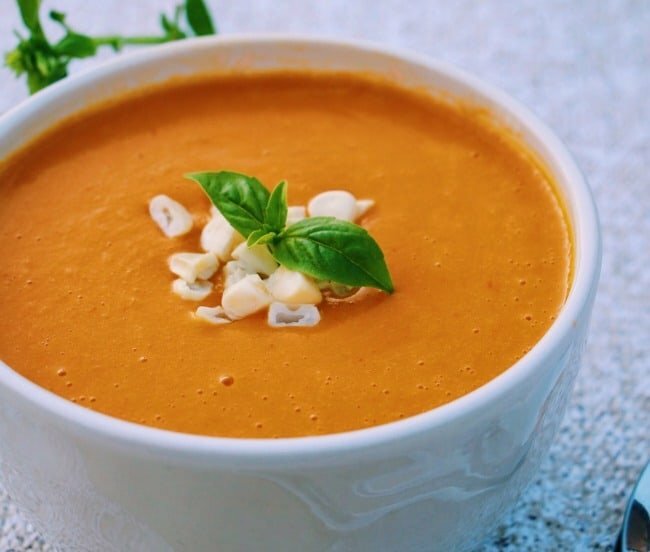 What is your favourite soup to celebrate the cooler weather coming through. Make sure to leave a comment, I would love to hear from you. Happy eating! This looks absolutely delicious. What a great idea to add sweet potato! Thanks Cecilie 🙂 I am a huge fan of sweet potatoes, so they find their way into a lot of dishes around here! this soup, couch and downton abbey. you made my day! Vibrant soups like this are NEVER boring. Really like the sound of this and it is such a beautiful colour. Oh thank you so much Choclette! The colour is amazing right! This soup looks sweet and delicious. I love the color and it looks so tasty and savory. Perfect for fall. What a wonderful sounding soup. This is perfect for our cold wet weather!! Good recipe. Soup is my absolute favorite comfort food – glad it’s not suitable soup weather in California. I’ve been going a little crazy with all the sweet potatoes so this is right up my alley. sounds great! I am just learning to love sweet potatoes. This recipe looks mouth watering. 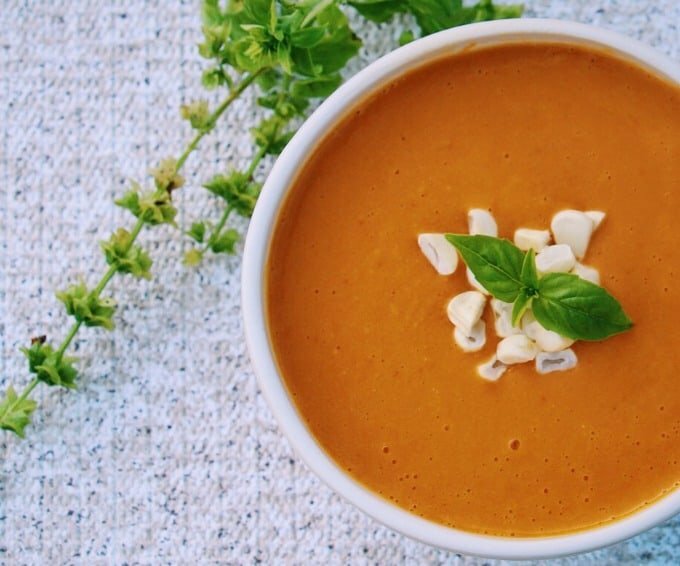 I have never eaten sweet potato soup and will definitely give this a go soon as it is getting rather cool here now. Looks creamy and delicious! This sounds like a delicious soup! Love the addition of the smoked paprika! Thanks Trish! Smoked paprika is my favourite thing right now – it fits in everywhere and tastes delicious! Donna I love soup too! This one has me drooling. Sweet potatoes are a favorite of ours. I will be pinning this beautiful recipe! Oh thank you so much for your lovely words Diane! Thing is I like soup whatever the weather so I am always up for it.. Lovely combo.